World War II veteran Joe Ondrej has done some living in his 86 years. By land, sea and air, he is traveled thousands of miles from his original home on a farm near Cameron. And, in his long journey, he’s out-lived all of his people. “When you lose all your people, what do you do? Ondrej asks. You turn to your friends, your memories and the Creator. And, Ondrej has a wealth of memories to draw on, memories of events he can still see vividly in his mind’s eye. He was mentally playing them back last Thursday when Ondrej gave an account of his service in World War II and his years as a mechanic and auto parts supply man in Hearne, the town he spend most of his 86 years in. Speaking from the Bremond Nursing Home, Ondrej began at the beginning. “I was born on June 29, 1921, in Cameron Texas, Milam County,” he said. After graduating from Milam High School in 1939, he volunteered to go into the military well ahead of the war and the draft. But, he didn’t want to go into just any branch. He wanted to fly. To fly in the Army Air Corps, one had to have at least one year of college, Ondrej explained. And, he was willing to go to college if that’s what it took. Instead, he went before a panel of five servicemen ranging in rank from lieutenant to general and answered their questions. “When thy got through with me, they all agreed I was qualified to fly.” He was 18 years old. After being inducted into the military at Ft. Sam Houston in San Antonio, Ondrej was sent to Randolph Air Force Base and assigned to the 47th School Squadron for training on the BT 7 and the BT 13 trainer planes. At Randolph Field just out of San Antonio, “I went in as a private and made all seven enlisted ranks in ten months” Ondrej was a master sergeant at age 19. During those 10 months, he worked as an airplane mechanic, a crew chief, line chief and technical inspector in charge of routine inspection and maintenance of aircraft and fire and safety for the entire base. One of his more interesting duties as Technical Inspector was safety observer on pilot instrument flights—part of a pilot’s training. He had to watch from a seat in the cockpit while a pilot flew hooded, relying entirely on instruments. Ondrej took care of maintenance at Randolph until the war began in December 1941. The following month, the squadron was split up and sent to different locations with Joe and his brother Ed, who had been stationed with him since ’39, being sent to Coffeyville, KS, to help open an advanced training base. There, bomber crews-in-the-making flew AT 6’s and AT 17’s (AT standing for advanced training). At Coffeyville, Ondrej served as technical inspector and set up the inspection office for the base. His team included four inspectors, a secretary and an engineering officer. But, as productive as all that was, Joe’s passion for action was not satisfied. Joe replied, “Anybody can do this job.” He explained that he had set up the office and it could run by itself. So, the Army sent him to Greensborough, North Carolina, a port of embarkation. There, he received training in all the handheld weapons the Army Air Corps used–the M-1 carbine, the 45-caliber army pistol and the 45 caliber Thompson machine gun. His experience with the Thompson machine gun was memorable. “There was no way you push the trigger and hold that gun steady.” If you were aiming at a wall, the bullets would climb up the wall. Training completed, Ondrej boarded a big ship, part of a 100-vessel convoy, and took off across the Atlantic in the dead of winter. It was miserable. The rain, the snow and ice, the wind and the freezing temperatures made it unpleasant for the troops and the 2,500-man crew. But, said Ondrej, it was well protected from German U-boats by two lines of destroyers that surrounded the entire convoy. The destroyers dropped depth charges when they detected a submarine in the area. However, they were not prepared for another danger–a case of meningitis. Ondrej saw a burial at sea, but not from military action. After 17 days of zigzagging across the Atlantic, the convoy landed in Glasgow, Scotland, just months ahead of the Normandy Invasion. Ondrej, now part of the 398-bomb group, was assigned to a base 30 miles east of London and 45 miles away from the English Channel. Its proximity to the Channel made sense because the purpose of the 398 Bomb group, part of the Third Army, was to soften up German defenses ahead of the invasion of Europe. For a few months, the crews trained on their Flying Fortresses–the B17E–and in May of 1944, the bomb group started flying over the French coastline and countryside to take out German artillery positions ahead of D-Day–June 6, 1944. Ondrej served as a flight engineer checking all the gauges, monitors, and other instruments to make sure the plane was running properly, and served as a part-time bombardier. He got the second job when the bombardier, copilot and a gunner of his B-17 crew were killed by machine gun fire from enemy fighters that swooped into their formation. Being a bombardier was easy, he said. “All I had to do was push buttons.” But, walking over the bomb bay was not. The B17E carried six 500-lb. bombs, three on each side of a narrow catwalk. “You didn’t want to fall off that catwalk,” said Ondrej. Flight Engineer Ondrej realized something on those flights over France that made a big difference in combat effectiveness. “In a clip in a 50 caliber machine gun–100 rounds in a clip–every 5th round is a tracer. It’s supposed to show you where the bullets are hitting. I told intelligence that the tracer bullet was giving a false reading because it had less powder and it was falling behind the target. Tracers were eliminated and the knockdown power nearly doubled.” Ondrej had made a significant contribution to the war effort. After taking the beach at Normandy, the allied forces under Patton, Clark and British General Montgomery moved into France, Holland, Belgium and then Germany, leading up to the German counter attack at the Battle of the Bulge. At first, said Ondrej, the American bomber formations encountered little resistance, but the further the 398 penetrated, the stiffer the resistance from German fighter planes. Luftwaffe fighter pilots would fly a few thousand feet above the US bomber formations and attempt to take them out with their guns. The U.S. countered, said Ondrej, with the P51 Mustang–the Cadillac of the sky–taking on the German fighters in high altitude dogfights. In the midst of all this intense Flying Fortress action, the Army Air Corps found out what Ondrej had done state-side and took him out of the air to head up their 478 Battle Damage Repair Squadron Depot. Before transfer, his last bombing run over Hamburg frightened not only the American bomber group and the Germans, but also Patton’s troops who had advanced 100 miles farther than they were supposed to. Ground control broke silence–something they were not supposed to do–and radioed the 398 with the message, “Hey Fellers, I’m on your side!” Said Ondrej, “I had a friend–Alvie Franks–who was down there. Ike [General Eisenhower] called Patton back to England and chewed him out.” Intelligence had not kept up with Old Blood and Guts’ advance. Patton, always a man with an apt reply, told Ike something like, “If you will give me the gasoline and the ammo, I will run those Krauts all the way back to Berlin, Germany.” Ondrej said those might not have been the exact words, indicating they may have been more colorful. Though Ondrej was back on the base, inspecting B17Es for damage and deciding whether to repair them or use them for spare parts, he wasn’t out of the woods yet. “We had a huge hanger,” said Ondrej, speaking of his shop and he was working in or around it when he received his single wound of the war. “I was working on top of an inner wing panel when a German fighter bomber strafed the base.” A piece of flying metal got stuck in his back. “They got me to the hospital in London and dug the metal out of me. I stayed in the hospital for two days, then they released me to the field hospital on the base.” They wanted to get him back to work, so he was essentially an outpatient, getting medical care while working to return planes back to service. He paused long enough one day to watch an American fighter pilot “buzz” the base, something the pilot did after every successful mission. He flew extremely low–almost hitting the ground–and flew back up by way of salute. This time, he over did it. The flyboy replied, “When I made this run, I felt vibration in the cockpit.” Ondrej said, “Well, get on down out of there and I’ll show you.” He continued, “I got him down, walked him in front of the plane, and told him to look at the prop blades.” He had damaged the ends. “Sergeant, you reckon I’m going to get in trouble?” he asked. Ondrej reckoned he might. It says something for the maneuverability of the P51 and the mentality of American fighter pilots. Soon, the war in Europe was over and Ondrej was called home. He came back with five metals, including the European victory metal and a purple heart. They sailed out of Glasgow on the Queen Elizabeth, the largest ship in the world at that time. A total of 14,500 people were aboard–4,500 were WACS–Women’s Army Corps. He’s also done a lot of thinking about World War II and what it meant. “It was the war that turned the world around, the war that defeated dictatorship and stopped it in its tracks,” a war that allowed Democracy to grow. 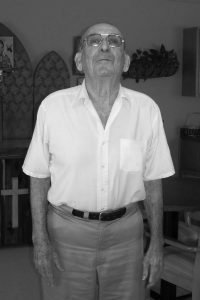 Ondrej took all he had learned, moved back home, and then moved to Hearne with his cousin in February 1946, to purchase a little grocery store/filling station. From there, he went on to become a mechanic–working in every dealership in Hearne, then later worked as service manager for Chrysler. In 1957, he opened his own auto repair shop, then, some years later, opened the parts store in Hearne, which later became CarQuest. In 2007, he was still helping people from his room in the Bremond Nursing Home.